The photographic studio of Heald and Giles produced this portrait of a distinguished older gentleman. The man is wearing a nicely groomed graying beard and mustache. He is displaying a serious expression on his face. Research reveals that Mr. Heald had a number of partners during his photography career. Among the names he operated his business under was Wright and Heald, and Heald and Erickson. The law journal, “Open Jurist” and several other turn of the century law journals, cite Mr. Heald in an important legal case. The case was “Corlis et. al. versus E. W. Walker Company et. al. (1894). Emily Corlis sued the Walker Company for inserting a portrait (photographed by Heald) of George H. Corlis in a biographical sketch about to be published. 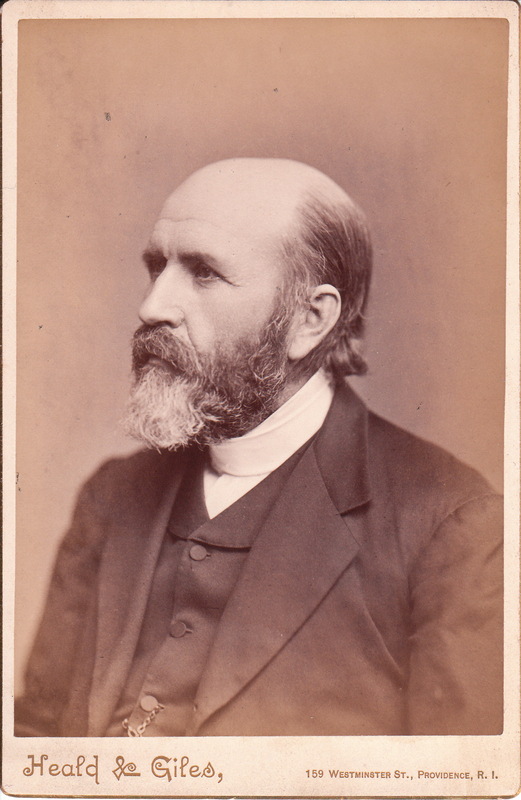 A photograph of the late Mr. Corlis had been submitted to the company by Emily Corlis but she had withdrawn her permission for them to use it after they had not complied with some of her demands. The Walker Company returned the photograph to her but then turned to Mr. Heald and purchased a copy of an original photograph Heald had taken of George Corlis. Emily Corlis was outraged and took Walker to court. The general policy of the courts, based on precedence. was that negatives of photographs belonged to photographers but the right to print negatives belonged to the customer (subject of the photograph). The court in this case, however, ruled that this case was an exception to precedence because the rule applies only to “private persons”, and not “public characters”. The court stated that Mr. Corlis was a “public character” because of his status as the inventor of the Corlis Engine. It seems that his portrait had already appeared in a number of magazines and other publications. Stated simply, pubic characters had no right to privacy. In addition, the court stated that Walker could not be sued because he was not the photographer. Only the photographer had a contractual obligation not to publish the subjects photograph without consent from the subject. To view the work of another photographer involved in an interesting court case related to the business of photography, and to learn about that case, click on the category “Photographer: Rugg”. This cabinet card photograph is in very good condition (see scans).